By making streets safer and more usable— for cyclists, public transportation vehicles and riders, and pedestrians of all ages and abilities—they are helping people be more physically active. Getting around Kershaw County without a car was a safety concern for many people who traveled by foot, bicycle, or wheelchair. A lack of regular physical activity was a major contributor to Kershaw County’s steady rise in rates of obesity, diabetes, heart disease, stroke, and other chronic health conditions. Among the county’s 62,000 residents, 70% were overweight or obese, and 28% led sedentary lifestyles. Without proper planning, Camden’s walkable, historic grid street pattern was slowly being replaced by suburban sprawl. 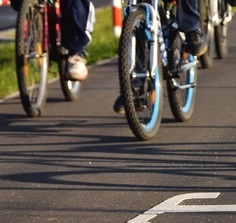 Making streets safer by building more sidewalks and bike paths could help people enjoy the many benefits of physical activity. Learn how Eat Smart Move More Kershaw County and the City of Camden involved residents and worked to meet national Complete Streets standards to help Camden, SC become a safer and healthier community.